MEMRI's Jihad and Terror Threat Monitor (JTTM) project has long been reporting on messages and videos released by the Islamic State (ISIS) threatening to carry out attacks in Spain, which is part of the international coalition fighting ISIS in Iraq and Syria. MEMRI also reported on this organization's increasing efforts of media outreach in Spanish and its attempts to recruit Muslim youth in Spain, especially members of the Moroccan community there. It should be mentioned that in the jihadi mindset and discourse, including those of ISIS and its supporters, Spain is considered to be "Al-Andalus," one of the main lands that were once under Muslim rule and must therefore be reconquered by means of jihad. 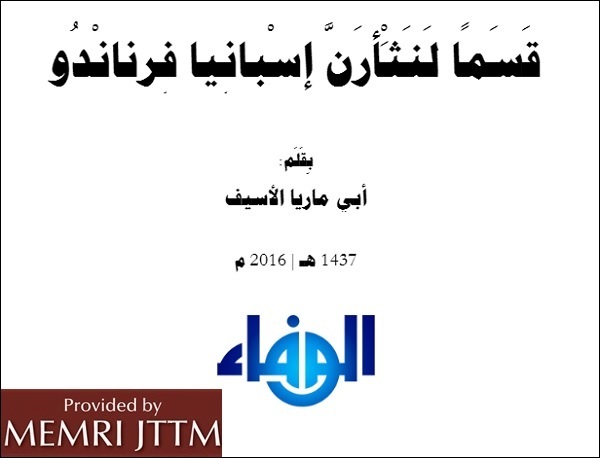 The following are excerpts from MEMRI JTTM reports on this posted in the course of 2016. In an article by the pro-ISIS activist group Al-Wafa Foundation, activist Abu Marya Al-Aseef called on Muslims to target nightclubs, shopping centers, ships, and airplanes in Spain using explosives, machine guns, and trucks, in order to avenge the crimes committed by Spain against Muslims, past and present, from the Inquisition to its participation in the coalition forces fighting terrorism. The article, titled "Spain [of] Fernardo, We Vow [to Seek] Revenge" and dated July 18, 2016, also called on the people living in Morocco, Tunisia, Algeria, Mauritania, and Libya to kidnap Spanish experts and either behead them or exchange them for Muslim prisoners. Urging Muslims to take action against the people of Spain, it stated: "Oh blessed brothers wherever you are: Strike anywhere you find suitable to be a target to discipline the Spanish criminals. The cities are full of them and [their places] of entertainment are everywhere. The shopping centers are overcrowded with the criminals. Hunt them down, with either booby-trapped [objects] or machine guns, or run them over with cars and trucks or sink their ships and derail their trains [and down their] airplanes, or [attack them] by spraying insect poison in water and food." Addressing Muslims in Morocco, Tunisia, Algeria, Mauritania, and Libya, the article urged them to kidnap Spanish agricultural experts working in these countries: "Kidnap them and exchange them for our prisoners in the tyrants' [prisons], or cut off their filthy heads as reprisal. As their governments kill our brothers, so should we [seek] revenge and reprisal." Vowing that the Muslims will conquer Spain "sooner or later," the article threatened that churches would be turned into mosques and that only those who converted to Islam, or else signed a contract of protection with the Caliphate, would be spared. Describing the "punishments" awaiting the people of Spain, the article said that they would be "more than the politicians and respected figures can imagine" and that their scope "would exceed what happened in France and other infidel countries." The article also accused Spain of killing 60,000 Muslims in the July 16, 1212 battle of Las Navas de Tolosa known in Islamic history as the battle of Al-Uqab, and referred to the Spanish Inquisition trials as "the greatest crime ever committed against the Muslims." "And to this day," it stated, "your soldiers are still killing Muslims in the eastern and western parts of the earth, sometimes with bomb-carrying air jets and other times with the direct participation [of soldiers] on the ground." After listing methods of torture and killing that it claimed that Spain had used against Muslims in the Middle Ages – including burning, sawing apart, using iron currycombs, and more – the article stated: "As your hearts gladly accepted the actions of your ancestors against ancestors, let your hearts accept our actions against you." For the report on MEMRI's JTTM website, see Pro-ISIS Jihadi Writer Urges Muslims To Carry Out Attacks In Spain, Kidnap Spanish Professionals In North Africa, August 2, 2017. On May 30, 2016 the "Al-Wafa Foundation," a pro-ISIS activist group, posted "A Message to the People of Spain and to the Spanish-Speaking Countries," which threatened these countries and their citizens with terror attacks unless they stopped fighting the Muslims and occupying Muslim land. The two-page message, dated March 28, 2016 and signed by "Abu Bara bin Malik - servant of the Caliphate," stated that ISIS "insists on killing infidels" because their countries wage war on the Muslims and kill innocents. Therefore, it threatened: "We will kill any innocent 'Spanish infidel' on the spot if we see one of you in a Muslim country," and also "kill you in your [own] cities and villages." The message urged the readers to pressure their governments and armies to withdraw from the war against ISIS. The threatening message could be a reaction to a series of arrests of ISIS elements in Spain which occured in February and March 2016. The message was distributed through the group's Telegram channel (@alwafaa5) in four languages: Spanish, Arabic, English and French. The following are excerpts from the English version. "We would like to introduce us to you: We are the Islamic State with Wilayat Raqqa in Syria as its capital. [...] You have lived dark days when we attacked your big cities like Madrid, Paris, London, Brussels, the Twin Towers and the Pentagon in America. The wise amongst you certainly wonder and ask for the reason why we target you, you might still be wondering why our soldiers, commanders and supporters insist on slaughtering you? "Here is the answer: Your countries, the one you pay your taxes to and vote for, order their armies to senselessly kill our innocent children, women and elderly on a daily basis. They are only guilty of being Muslims. They are only guilty of wanting free countries to live under Allah’s rule [...] not with your laws that robs our money and kills and imprisons our people. "To this day, you leaders have killed no less than 300 innocent civilians in Iraq and Syria, by air dropping tons of destructive bombs and chemicals that you pay for. You are being happy on your holidays, celebrations and festivities, while our children bleed. "And for those reasons we say to you: We will kill any innocent 'Spanish infidel' on the spot if we see one of you in a Muslim country. If we are unable to reach you in our land, our men and women who believe in our doctrine are already living among you. No one knows their name of what they look like, yet they will kill you in your cities and villages, just as previously planned. "We convey our message to you in a language that you understand so you can stop your army’s aggression on our innocent people, our homes and property. "This is your chance to pressure your armies, thru organizations, corporations, law associations and others, to stop this destructive war, if you really want to safeguard your lives. We did not oppress nor assault you; you are the ones who are sending their planes to kill our families, stealing our oil and minerals and others, through traitorous Arab agents, who were appointed and forced upon us inside our homes. "Know that proxy wars will not prevent us from coming towards you and killing you unless you stop occupying our lands and killing our innocent people. Now who are the terrorist? Us or you?" For the report on MEMRI's JTTM website, see Pro-ISIS Group Threatens Citizens Of Spanish-Speaking Countries: We Will Kill You Wherever You Are Unless You Stop Fighting Muslims, May 29, 2017. On June 14, 2016, ahead of Spain's June 26, 2016 general election, the pro-ISIS media group Al-Wafa posted an article in Arabic titled "Message to the People of Andalus [i.e., Spain]." The article, signed by "Abu Bakr Al-Maghribi" and distributed via the group's Telegram page, called upon the citizens of Spain to take advantage of the election to replace the ruling party with "the new political movements," hinting at the left-wing party Podemos. The author, whose name suggests he is of Moroccan origin, urged the Spaniards to elect a new government that would withdraw from the cities of Melilla and Ceuta (autonomous Spanish cities in North Africa) and "stop persecuting Muslims." Otherwise, he said, they and their families would "drown in Rivers of their own blood." The author accused the Spanish government of massacring thousands of Muslim women and children in Afghanistan, Syria, Iraq, Yemen and Mali. He stated that the new parties and movements that have emerged in Spain and in other countries (apparently a reference to the Syriza party in Greece and to radical currents within British Labour) recognize the need to stop the aggression against Muslims and even compensate them for the years of discrimination and abuse. Therefore, he urged the Spanish voters: "In order to keep yourselves safe from raids like those [that took place] in New York, Madrid, Paris, London and Brussels, you must consider the new political options... Though we know that these new parties and currents were funded in the past by the infidel Iranian regime, they are still the best solution to the situation in which you find yourselves as a result of your ongoing attack [on the Muslims] over the years." He added: "If you want to live in peace, you must force your Spanish regime to stop stealing our natural resources and to stop imprisoning and killing our brethren in Andalus [Spain] as well as in Syria, Iraq and Mali. This is your chance to determine your future and your fate. If you refuse, your punishment will be catastrophic... We swear that eventually you and your families will drown in rivers of your own blood." For the report on MEMRI's JTTM website, see Pro-ISIS Media Group Threatens To Target Spain Unless New Leadership Is Chosen In Upcoming Elections, June 15, 2017. "Things are changing: you were oppressors and now you are oppressed; you lived in comfort and now you are terrified. You should expect from us [attacks] that will make you forget September 11 and the Paris attacks... And by Allah, you will pay a steep price that will offer a glimpse of the bitter end and will bring about the recapture of Al-Andalus. "O beloved Andalus. O stolen Andalus. Do you think we have forgotten you? No, by Allah. What Muslim could erase from his memory Cordoba, Toledo and Shatiba [Xativa]? What sincere Muslim has not made the oath to regain you? Be patient, for you are not Spanish, you are not Portuguese. You are Andalus of the Muslims." A video posted by ISIS on September 6, 2016 showed children whom the group says were being trained to become "the arsenal and the elite [soldiers] of the caliphate's army and the generation which will conquer Damascus, Baghdad, Jerusalem, Makkah, Medina, Dabiq, Rome, and Spain." 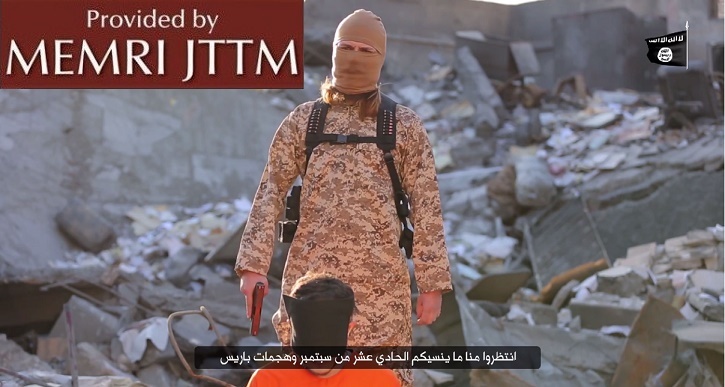 For the full report on this vide, see MEMRI JTTM report, ISIS Video Features Children Who Aspire To Martyrdom, Says They Are Being Prepared To Conquer Rome, Spain, September 06, 2016. On August 17, 2016, the pro-Islamic State (ISIS) media group Al-Thabat released a video in which it urged Muslims to carry out attacks in the West, specifically in the U.S., France, Belgium, Italy, Denmark, Spain and also in Russia and Iran. The video begins with a series of slides listing these countries, with the narrator calling for Muslims of these nations to: "Raise the banner of jihad in the kuffar's [infidel's] own soil, and fight them the way they fight your brothers. Fight them and make their lives full of terror. Get up and fight them even with a knife... Rise, my unifying [i.e., monotheist] brother, and kill them in markets or in train stations, or in their homes or anywhere." For the full report on this video see MEMRI JTTM report, Pro-ISIS Media Group Releases Video Calling For Attacks In U.S., France, Belgium, Italy, Denmark, Spain, Russia And Iran, August 16, 2016. In a video clip posted online on July 1, 2014, an ISIS fighter says, in Spanish: "Spain is the land of our forefathers, and Allah willing, we are going to liberate it, with the might of Allah." Following are excerpts. Mujahid: "Assalaam Alaykum, we are in the Holy Land. Allah be praised, we are in Syria. Today, we're going to speak in Spanish. I have with me my brother. Go ahead, man." Second mujahid: "In the name of Allah, the Merciful, the Compassionate. Thanks be to Allah. Allah be praised, we are in the Holy Land, the land of Sham. "I say to the entire world as a warning: We are living under the Islamic banner, the Islamic Caliphate. We are going to die to it until we liberate all the occupied lands, from Jakarta to Andalusia, Allah willing. "I tell you, Spain is the land of our forefathers, and, Allah willing, we are going to liberate it, with the might of Allah." On ISIS's recent media outreach efforts targeting Spanish-speaking audiences, see MEMRI Special Dispatch No. 7057, ISIS's Increasing Online Outreach In Spanish, Threats To Spain, In Report Posted by MEMRI's Jihad and Terror Threat Monitor (JTTM) Project In April 2017, August 18, 2017. On this see MEMRI Daily Brief No. 85, Spain In The Crosshairs Of Islamism, March 28, 2016. The left-wing Podemos party was founded in 2014 in the aftermath of the protests against inequality and corruption in Spain. Along with several other movements established after these protests, it was poised to gain a substantial victory, but eventually failed to meet expectations that it would become the country's main left-wing party. A reference to allegations in the Spanish press that Podemos received illicit funding from the Iranian government. See http://www.independent.co.uk/news/world/europe/podemos-spains-anti-corruption-party-received-illicit-funding-from-iran-a6813006.html. The video was posted on the jihadi forum Shumoukh Al-Islam (Shamikh1.biz, January 30, 2016).